On July 22, 2016, Ivanka Trump introduced her father at the Republican National Convention as a Republican nominee for US President. It was not her powerful speech alone that captured the attention of the masses; her radiant pink dress also got a thumbs up. Even though that particular dress was not available until the following fall, a similar blush-colored dress from Ivanka Trump Collection was sold out at several retailers that very same day. Were they ready for this? This is just the tip of the iceberg of problems faced by Apparel and Footwear retailers today; making them different from others in the retail bandwagon. This industry is unique due of its sheer complexity i.e. products are seasonal, brand/chain specific, short-lived and purely desire-driven; as opposed to the need-driven. Let us explore some of the data-related challenges that make Apparel and Footwear Retailers “special”! Time to market: Apparel and footwear industry is transforming to a “fast fashion industry” where speed to market is the lifeblood. To reap huge revenue gains, retailers have to launch their latest designs quicker than the competition. Also, news events can drastically shrink the response window for retailers like the “pink dress” incident. While speed is important, a short timeframe from design to till does not mean a large margin for errors i.e. data quality is equally important. Real-time inventory visibility: Most apparel and footwear fads are seasonal in nature, unpredictable, and short-lived. Most retailers’ strategy is to empty their store inventory quickly by offering discounted prices but still reap a profit margin. To avoid excessive markdowns while minimizing stock-out situations, real-time inventory visibility is required across all locations to manage seasonal trends, identify poorly performing categories and provide detailed information about inventory availability to all channels. 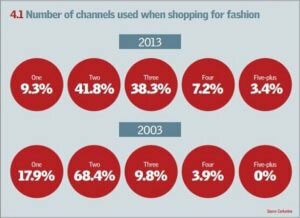 Multi-channel Retailing: Consumer purchasing decisions have dramatically altered. Even when standing in the stores, they may be using their smartphones to compare prices and product reviews; while their family and friends instantly weigh in on shopping decisions via social media; and by the time they are ready to buy, a swarm of online retailers deliver products directly to them. A report submitted by Conlumino; a retail research agency and consulting firm, shows that most customers use up to 5 channels during shopping. The report also gives a channel-wise breakup. Multi-channel planning: Multi-channel retailing calls for multi-channel planning i.e. retailers should be able to aggregate forecasts and plan information across multiple channels to one holistic view. Without an enterprise view of data, some companies will not be able to link data across channels to answer basic questions, such as “How many gray t-shirts did Mark Zuckerberg buy online vs. in store?” This can lead to inventory imbalance across channels leading to shorter inventory life cycles and complex fulfillment processes. Maintain brand consistency: Maintaining brand consistency can be a daunting task with multi-channel retailing, M&As and international expansions. Today’s consumers expect a seamless brand experience irrespective of the channel – whether they are in the store, browsing the e-commerce site, viewing the catalog, or interacting with the customer representatives. After M&As and international expansions, segmented brand management among different business units and too many silo-ed information systems often result in a fragmented approach which can be damaging to a company’s brand image. Minimize Product Returns: A large number of products are returned because of incorrect product information. For example, the actual color of the product may not be what was advertised, or website shows a different price than that of the store. With 95% of today’s customers being multi- channel shoppers, they expect accurate and consistent information across channels. So the price for these data errors is reduced margins and frustrated customers due to more product returns. Enhance in-store shopping experience: Another differentiator to stay ahead of the competition is to offer superior in-store shopping experience. This involves empowering the store associates by giving them access to the right information about the right product at the right time. They should have access to customer’s personal preferences, up-sell and cross-sell options, promotions, and visibility to inventory in other locations in case of a stock-out. The need of the hour is a solution that can act as the master source for all the data; or better known as Master Data Management (MDM). But how can an MDM tool help? “Golden Record”: By acting as a single gateway, MDM can avoid data discrepancies and ensure that right and consistent information is disseminated to all the systems simultaneously, say stores, terminals, e-commerce and mobile channels. Dynamic workflows: Since time to market is crucial, “pushing out” products to the store is a priority which means retailers should have the ability to make workflows adaptive based on business conditions (like “pink dress”) and work only on data records flagged as “exceptions” based on pre-defined business rules. Multi-domain data: Holding data from multiple domains on the same platform not only improves product traceability but also gives a peep into your customer’s buying journey. “Locale”s/ localization option in MDM can handle scenarios where the data to be published to various consuming systems should be altered based on geography. This will also support all future expansion plans as it supports multi-currency, multi-tax, multi-language and multi-accounting features. Product Relationships: MDM solution can support the creation of different product relationships and assortments from the SKUs (based on color, size, fabric, etc.) like cross-sell, up-sell, ‘shop the look’ etc. which can help boost sales. Seasonality Management: Most products in Apparel and Footwear industry are seasonal in nature which means data across the supply chain has to be managed according to the season, collection, and theme. Catalog extension feature in MDM can help create and maintain SKUS in the parent catalog and extend it to child catalogs (e.g. season, collection, theme catalogs) thereby eliminating data and effort duplication. I have only listed few of the many different ways an MDM tool can help this industry. Opportunities are umpteen. Let MDM make Apparel and Footwear great (again)!